This post is way overdue, since my baby - now toddler started walking back in February. I took these pictures of his very first pair of shoes, but never got around to posting them. 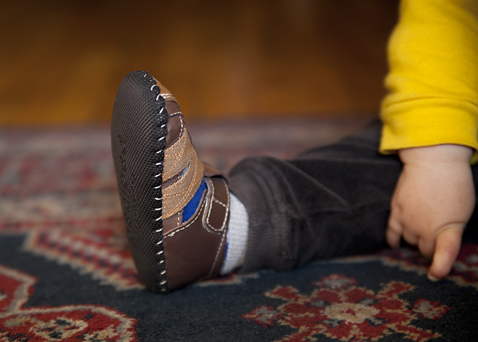 When baby B took his first steps, I started obsessively researching First Walker shoes. I knew he needed something very light and flexible, that would not restrict the natural movements and development of his little feet. Though there were a variety of brands that fit the bill, after reading tons of reviews, I settled on Pediped Originals Aaron sandals. These little shoes were perfect! They exceeded my expectations. Hand made of soft leather inside and out, the Aaron sandals are super flexible, light and breathable. Take a look at the rubberized sole that provides traction on a slippery floors. Just what my little guy needed! 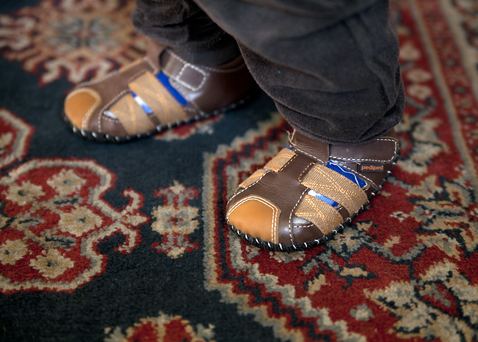 As an extra bonus, these shoes are made to last and can be passed down to younger siblings once baby outgrows them. Now that my son has fully mastered walking, I'm about to order him toddler sandals with a more structured sole for the great outdoors. Will post a review once he breaks them in.